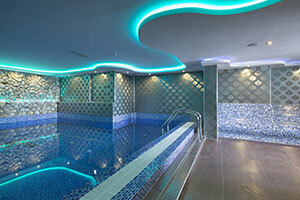 An indoor pool lets you enjoy swimming 24/7, whatever the weather. But if you live in the city, where do you find the space? Basement pools are the answer. £ 6,000 per square foot. Fortunately that isn’t the cost of building an underground swimming pool, but it is the price of London’s super-prime housing. To say that space is at a premium in London in particular is something of an understatement and a combination of property prices and the lifestyle needs of many of the people buying those properties have driven the growth of the basement pool. Luxury loft conversions and roof gardens just don’t cut it anymore. The smart money has started to dig down in order to extend their property and what better to have in your basement than a swimming pool? It’s possible that the first basement pool garnered the sort of reactions that were normally associated with the discovery of a James Bond villain’s secret lair, but underground pools are now en vogue and becoming less of the preserve of the super-rich and famous. Of course, there is no upper limit on what can be spent and some pools are the absolute height of luxury and sophistication. One multi-millionaire planned to excavate beneath his 19th century home and install not just a 14 by 8 metre pool but also a gym, a ballroom and a 3 car garage. The design of basement pools can be equally indulgent, extravagant and indeed, delightful. Depending on your taste, you might have an underground grotto with cave-like stonewalls and a waterfall running into a spa beside the pool. You might be attracted by the idea of marble columns and arched ceilings in the style of the Basilica Cistern in Istanbul or you might go for a modern, graphic approach. If you opt for the latter, stainless steel pool fittings – skimmers and inlets – will add a classic finishing touch to the design. Pahlen of Sweden make a particularly good range. Clean, simple shapes; well-designed lighting and the careful use of a small palate of high quality surface finishes can give a basement pool a unique, modern beauty and create a private space that is unlike any other. Obviously, for an underground pool, lighting is one of the most important considerations and EVA Optic produce LED lighting solutions that are not only beautiful but also resistant to the conditions of a swimming pool environment. If you are thinking that you need to be on the Sunday Times ‘Rich List’ to indulge in a basement pool, you might be pleasantly surprised. It is possible to have a 4 by 2 meter pool with a swim jet or counter-current unit such as a BADU unit– which gives a swimmer a resistance current to swim against – installed beneath your house for about £30,000. Building a basement pool is obviously not a weekend DiY job and any professional contractor who has had experience in this area before will know what planning permissions are required for your area and what building regulations apply and be able to advise you accordingly. Working below ground is a specialist area and there are some specific regulations that apply. All floors and walls that are below ground level need to be waterproofed, or ‘tanked’ as it is sometimes called. Existing walls may have to be underpinned and additional joists and steelwork might need to be installed in order to support your property above. You will almost certainly have to ensure that there is a suitable fire escape from the basement, an adequate ventilation system and insulation to comply with building regulations. Different councils can ask different things of you when it comes to a basement conversion, so it is important that you speak to them before you plan or start any work. There are many more articles on this site that will give you information on almost every aspect of your pool.